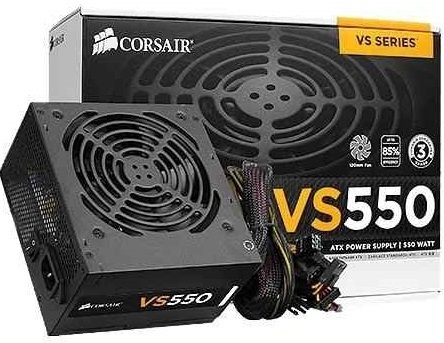 The Corsair VS550 is a great choice if you’re building a home or office system with lower power demands, but you still demand the compatibility and reliability that Corsair is known for. The VS550 delivers a guaranteed 550 Watts of continuous power. With 0.99 Active Power Factor Correction, you get the peace of mind from knowing that your components are protected from uneven power delivery. And, a dedicated single +12V rail saves you from the hassle of balancing your components across multiple power cables. The 120mm fan is thermally controlled, so it only spins at maximum speed when it’s pushed hard – and even at full load, it’s pretty quiet. Smart design features like this are why VS550 offers up to 85% efficiency. Your PC system will generate less heat, and you’ll enjoy lower energy bills. The black powder-coated enclosure and the black-sleeved cables give any system a polished look. You’re building a PC, not a battleship, and with the VS550 you can avoid that look of unpainted steel that you’ll find on so many entry-level power supplies. VS550 is backed with a three-year warranty, and you get lifetime access to Corsair’s legendary technical support and customer service.